Study shows that climate-skeptic bloggers often use limited disagreements to cast doubt on the big picture. (Inside Science) -- Thousands of scientific papers about climate change are published in journals each year. Far fewer discuss how skepticism toward mainstream climate science spreads. A group of scientists has now plunged into one of the habitats where so-called climate change skeptics have prospered -- the blogosphere. They found that climate science-doubting blogs cite a small cast of alternative “experts” rather than those with views aligning with the scientific consensus, and seek to undermine all of climate science by casting doubt around limited, hot-button issues. Nearly all climate scientists agree that Earth’s climate is rapidly warming, that humans are causing it and that if nothing is done, climate change could have catastrophic consequences in the coming decades. A lively countercurrent of thought exists, however, on internet blogs. Many blogs question how much Earth is warming, how much humans are causing it and whether the warming warrants a major societal response. These blogs are read by millions of people each month, and are often cited by conventional media outlets and by policymakers. So persuasive have climate doubters been that between a third and a half of Americans believe the globe is not warming, or that it is but humans are not the primary cause, according to recent surveys. Jeffrey Harvey, an ecologist at the Netherlands Institute of Ecology in Wageningen, assembled a team of climate scientists, communications experts and biologists to study how climate change-doubting blogs influenced this gap between the perceptions of scientists and the public. The team’s effort focused on the specific example of how bloggers handled global warming’s effect on polar bears, a charismatic species that has become a literal poster child both for those advocating for climate action and for their detractors. Most experts, and the International Union of Conservation of Nature and the U.S. Fish and Wildlife Service, believe that polar bears are threatened because the Arctic sea ice from which the bears hunt is disappearing due to global warming. Writers on many blogs that reject the scientific consensus on climate change, however, promote divergent views on polar bears. Some claim that sea ice is receding too slowly to affect the bears. Others argue that the species is not endangered because populations have stayed steady during recent losses in sea ice. Still others assert that there is too much uncertainty to project how polar bears will fare in the future. These blogs’ authors often extend their arguments to question the overall influence of humans on climate change, and label those who say polar bears are threatened as alarmists. To examine how blogs handled the scientific evidence for human-made global warming when discussing polar bears' long-term prospects, the research team, which included several polar bear experts, analyzed 90 blogs -- 45 of which endorse the scientific consensus on climate change and 45 of which do not. 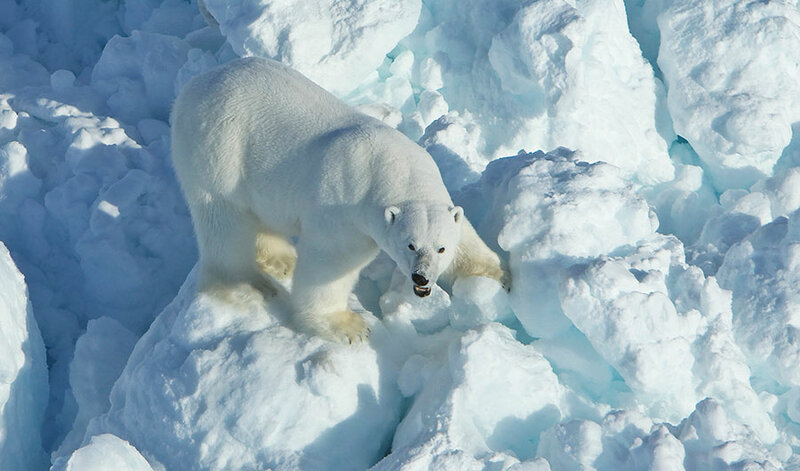 The researchers also examined 92 recent scientific papers that addressed the evidence for sea ice loss and its impact on future polar bear populations. Using techniques from statistics and a discipline called communications studies, the team assigned a location on a graph to each blog and each paper based on the language it used to discuss polar bear endangerment. One axis of the graph measured how strongly each paper or blog asserted or disputed that sea ice is declining and polar bears are threatened; the other measured how strongly each source described bears’ adaptability. The blogs that accepted the climate change consensus clustered in the same part of the graph as the vast majority of the peer-reviewed papers, which are evaluated by other scholars before publication. Nearly all the doubting blogs, meanwhile, clustered in a separate region, revealing a sizable gap between the blogs and the science. The paper was published online Nov. 29 in the journal BioScience. “I expected that [disparity] up front, but I didn’t expect it would necessarily come out this clearly and cleanly,” said Stephan Lewandowski, a psychologist at the University of Bristol in the U.K. and a paper co-author. Six scientific papers arguing that polar bears may be able to adapt to shrinking sea ice by hunting on land clustered in a third area. Few blogs of either type aligned with these papers. Most climate-doubting blogs ignore or selectively cite the scientific literature on climate change and polar bears, Harvey and his co-authors found. Additionally, the blogs often cite authors who do not publish regularly on polar bears in peer-reviewed journals. The researchers traced arguments on roughly four-fifths of the climate-doubting blogs they studied back to one blog, “Polar Bear Science,” written by Susan Crockford, a biologist and co-founder of the company Pacific IDentifications, Inc., which specializes in identifying animal bones. Crockford has written extensively about polar bears online, including books for children and a novel, and strongly questions the notion that they are threatened. Inside Science was unable to find any peer-reviewed papers about polar bears authored by Crockford. Crockford declined requests from Inside Science for an interview. In a blog post also dated Nov. 29, 2017, she described the BioScience paper as an “attack” in response to a paper she published earlier this year in the journal peerJ. That paper, which was not peer-reviewed, argued that because polar bear numbers have remained relatively stable despite faster-than-expected sea ice loss over the past decade, scientists’ predictions of future population declines are flawed. This “keystone domino” strategy “was a really interesting context that the paper introduced,” said Amelia Sharman, a researcher at the New Zealand Productivity Commission who has studied how bloggers discuss climate change. She added, however, that the finding that skeptical blogs and the scientific literature diverge is “not hugely surprising.” She also noted that unlike Harvey’s team, she found blogs taking intermediate positions between fully supporting the consensus view and fully denying it. Harvey hopes his team’s study will compel more scientists to engage on blogs and other public forums, as his Pennsylvania State University-based co-author Michael Mann and a handful of other climate scientists have. "I think the deniers are much better schooled in public relations than we are. … I believe they’re winning the debate," Harvey said. "That’s because many of us are not forcefully enough challenging them and exposing the distortions of what they say."